Düsseldorf - Borussia Dortmund found themselves in an unfamiliar position at the turn of the year. In each of the past two seasons, they have gone into the winter break well in contention at the top of the table and subsequently went on to win the title with a stunning second half of the campaign. Laying the foundations for a similar onslaught this term, Dortmund once again checked into the La Manga resort in Spain for a week. Only this time, even a record run in the coming 17 games may not be enough to retain the Bundesliga plate. In 2010/11, Dortmund ten points clear of second-placed 1. FSV Mainz 05 at the midway stage. Last season, they were second, just three points adrift of FC Bayern Munich. Yet this year, the Westphalians are a hefty twelve points behind the Bavarians. Defending their title may be improbable, but the recent arrival of Nuri Sahin has fuelled optimism that the Yellow-Blacks can perhaps make the impossible possible. Overturning such a daunting deficit may be too much to expect, though, and Dortmund's sporting director Michael Zorc hopes Sahin will not be made out to be a Messiah. "Please don't raise expectations so high that Nuri has to run around carrying a rucksack," he appealed to the BVB fans. "He needs to be able to develop in peace and quiet so that things turn out successfully." 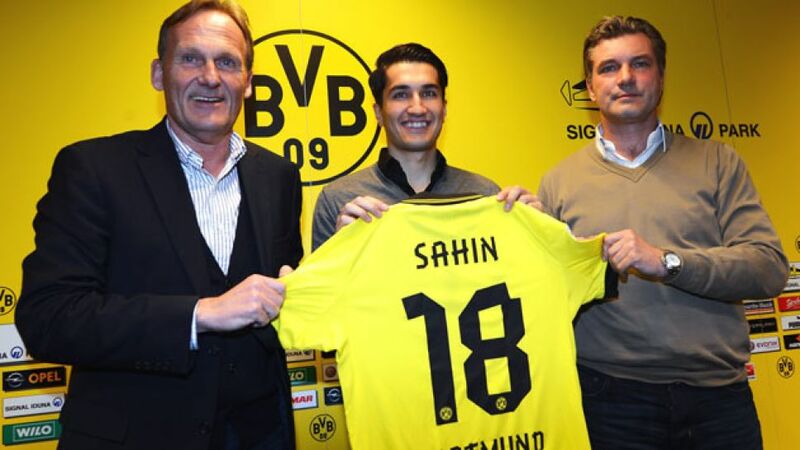 At times in 2010/11, Sahin seemed to carry responsibility almost effortlessly for the club. Voted by his fellow professionals as the Bundesliga's player of the season prior to his move to Real Madrid CF, the expectations on his return are understandably high. But he joins the Westphalians after 18 months without regular football and to expect the same magic immediately from the Turkish international would be hopeful to say the least. “He’s not had an easy time with Real Madrid and recently at Liverpool,” said coach Jürgen Klopp. “Whenever he has been playing, he’s been out of position. He wants to start over and we’re delighted he wants to do it with us.” That delight should be transmitted to the fans, whom Klopp hopes to give plenty to cheer in 2013, even if they must relinquish their title crown. Dortmund have already set about entertaining their fans by lifting the Wintercup in Düsseldorf on Sunday. A 1-0 win over tournament hosts Fortuna was followed by a penalty shoot-out victory over Mainz, and Marco Reus, Mario Götze, Robert Lewandowski & Co. visibly enjoyed themselves. Dortmund’s fans may not get to see their team celebrating a third consecutive Bundesliga title in the city centre come May, but who says you cannot have fun finishing second? Progress to the latter stages of the UEFA Champions League would certainly sweeten that potential blow.